Yesterday, I witnessed evidence that we indeed live in the brightest timeline. But we’ll have to build up to that. Among other things, yesterday was the day that Nintendo aired a big, beautiful Nintendo Direct focused solely on Super Smash Bros Ultimate. Despite the fact that I’m already 100% on-board for the new Smash, I was a little bit concerned about what could be revealed in this presentation. You know, given some of the more questionable design decisions in Super Smash Bros for Wii U. But it all turned out great! Everyone is here and everything is great! I won’t ponder everything that they showed off, but I am going to discuss some of the things that I found the most interesting and/or hype-generating. Castlevania – So the Direct starts off by revealing that Simon Belmont is now a fighter. Okay, cool. That’s literally all I needed. A++ presentation. Thank you and good night. Then they go on to show off this sweet new Dracula’s Castle stage, and that Richter Belmont is also going to be a playable fighter, as an Echo of Simon. Okay! Super! Really, you had me at Simon. Then they show off all the cool monsters that will appear in Dracula’s Castle, and that Dracula himself will show up and do the traditional Dracula boss fight from all those Castlevania games that he’s in. Guys really you have done a wonderful job. THEN they show how there are going to be over 30 music tracks from the Castlevania series in the game. Also there’s going to be a Death’s Scythe items that instantly kills fighters with high enough damage, and Alucard is an assist trophy character. I’m dying now. Dying of happiness. Castlevania is one of my favourite video game franchises and it just invaded Super Smash Bros in a major way. Thank you, Mr. Sakurai, for giving me this. Simon is going to be my new main. Sorry Ike, but there’s a new beefcake in town. But! 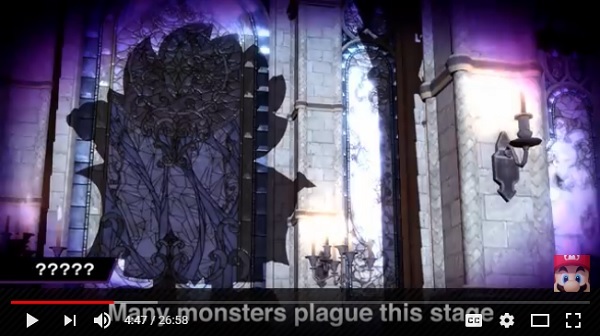 The cherry on top here is that when they showed off all the monsters that can appear in Dracula’s Castle, there was a shadow that was noted only as ?????. You know what that is? It’s friggin’ Dracula-Kun! Yes, the main character of the Castlevania parody series Boku Dracula-Kun -also known as Kid Dracula or Baby Alucard- is in Super Smash Bros. I could never have even dreamed of something so wonderful happening. There are only two other things in the world that could make me this happy, and one has absolutely nothing to do with video games. So yes, I’m pretty damn stoked on this new Smash game. Shovel Knight – Shovel Knight is in Smash too! Oh, happy day! …but he’s just an assist trophy? Oh… Well that’s a little disappointing. But Shovel Knight is still in Smash! He’s now officially reached the Legendary tier of video game characters. Did you know that Shovel Knight is my favourite anything of everything? Chrom and Dark Samus – Two popular characters that I don’t really have much of affinity for, being introduced as Echo fighters. Chrom seems to be a faster version of Ike, which is… I’ve always been fond of Ike the way he is. He’s so immensely powerful that I don’t mind the lack of speed. And Dark Samus… whatever. She’s cool, but I’ve sadly grown out of Samus. She was my main in Smash 64 and Melee, but those days are behind us. Stages – New Donk City Hall is the other new stage that they showed off in this Direct, and it looks pretty sweet. What really needs to be mention is that there are 103 stages in Smash Ultimate. One hundred and three. That… that may be too many. I already had a tough time picking a stage from Melee’s 29 options. Probably I’ll just pick Dream Land from Smash 3DS all the time because that’s the best stage ever. Oh! But there’s a stage morph option now that makes the game flip between two stages, which is neat. I would love if it could just morph into anything at any time, but I can see how that might be unfeasible. Final Smash Meter – This is a feature that needed to be there from the point where Final Smashes were first introduced (Brawl). Instead of breaking a Smash Ball, a meter builds during the fight, and when it fills, you get a Final Smash! It’s less powerful than the Smash Ball version, but that’s okay! This is how every other fighting game with equivalent super moves works, so it’s weird that Smash Bros hadn’t incorporated it until now. I would like to take a little sidebar here to reiterate how brilliant the Fake Smash Ball is. I love it. Monster Hunter – Smash 4 had a couple Monster Hunter costumes for the Mii Fighters as DLC, but Smash Ultimate is ramping it up a bit with… Rathalos? Just Rathalos? Apparently he appears as a boss, and also an assist trophy, but they didn’t really elaborate on anything else. The stage on which he is a boss is clearly based on the Ancestral Steppe map from Monster Hunter 4 Ultimate, but they didn’t call it out at all. And does that mean that there will be a Hunter as a playable fighter? Really, the Rathalos clip just left me with more questions than anything. Regardless, I am jazzed that Monster Hunter is now officially a part of Smash. Other stuff – The menu seems to be… slightly better than Smash Wii U’s awful mess? It still looks like a big mess, but at least it’s laid out a little better. I can still see myself getting lost trying to find anything that isn’t the main Smash mode, so that’s not great. I’m curious about the mystery mode that they censored out for this video, but not so much that I feel the need to speculate. And: It looks like they fixed Classic Mode! It’s just like it used to be in Smash 64 and Melee, but tailored to each character! It remains to be seen if it’ll be fun again or not, but it’s looking good so far! Hopefully that dreadful Master Fortress has been trashed. King K. Rool – I’m all for adding more villains to Smash (because you can only have heroes beat each other up for so long), but I personally don’t give a single flip about K. Rool. Here’s a third Donkey Kong series character that I’ll never play as. Where the heck is Dixie already? K. Rool’s reveal trailer was absolutely the best thing, however.